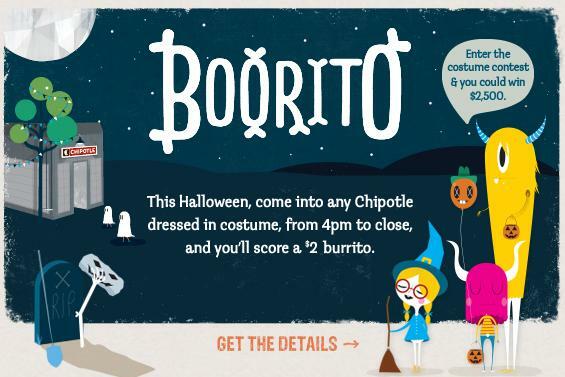 Chipotle Halloween Special - Dress in costume, get a $2 burrito! Dress up in your favorite costume and head on over to Chipotle after 4 p.m. on Halloween, and score a $2 burrito, bowl, salad, or order of tacos! Yum! You can also enter the costume contest by taking a photo of yourself in costume either inside or in front of a Chipotle restaurant on Halloween and submit it at chipotle.com/boorito by November 2nd. Grand prize is $2500, Runner Up Prizes are $1000, and 20 Runner-Runner Up Prizes are burrito parties for ten at the Chipotle of your choice.